Falkirk have signed goalkeeper Harry Burgoyne on loan from Wolverhampton Wanderers until the end of the season. The 22-year-old was involved in training for the first time this morning and has signed until the end of the season. Burgoyne has experience playing for Wolves, including an FA Cup victory over Liverpool at Anfield, but was not getting any game time at the club with Rui Patricio and John Ruddy ahead of the youngster in the pecking order. Burgoyne joins Robbie Mutch, Leo Fasan and David Mitchell at the Falkirk Stadium. 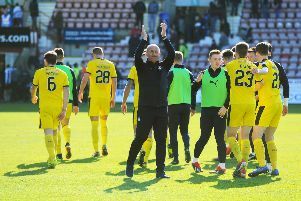 Manager Ray McKinnon told the Falkirk FC website: "We have been working with Wolves to make this deal happen and we are delighted to get it over the line. "Harry is a commanding presence and is a really promising young talent for Wolves. They want him to go out to a good level to get game time and we are really pleased that they have chosen Falkirk as the place for Harry to continue his development."